Floor Scrubber utilizes cylindrical brush technology. Gas Scrubber System removes rail car vent emissions. Multipurpose Floor Scrubber combines flexibility, productivity. Compact Automatic Wet Scrubber cleans metal masks for 0402 chips. Tower Scrubbers are engineered to application requirements. Venturi Scrubbers come in pre-engineered and tested packages. Cylindrical Brush Scrubber floats over floors. 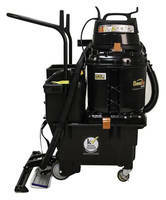 Walk-Behind Automatic Scrubber cleans 30,000 ftÂ²/hr. While featuring narrow profile that promotes maneuverability, BD 28/20 is suited for wide-area cleaning in such areas as grocery stores, retail facilities, and hospitals. Unit lays down cleaning solution, scrubs floor, and vacuums away soil and moisture via single-pass cleaning and drying, and design allows 180Ã‚° turns to foster maneuverability.